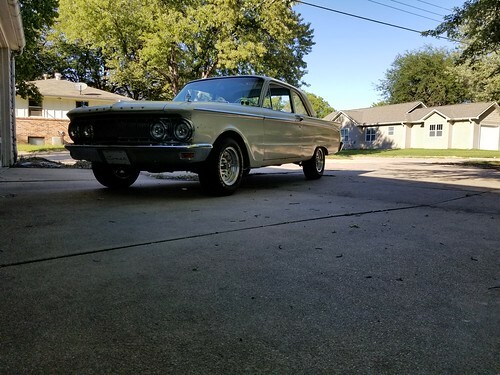 I have a 63 Comet Custom. 170, I believe. Under medium to hard acceleration, when shifting to next gear, it drops a cylinder for about 10-15 seconds. Then it fires back on all 6. 3 speed manual. Any thoughts? Well, its 1 of 3 things and im gonna say fuel is not likely to be the issue here. So its either ignition or compression and its rather unlikely to be compression too. So im gonna say ignition seems most likely culprit. I would however check valve adjustment if you havent yet, and try to verify which cylinder it might be. But could be spark plug wires or coil failure, spark plug wires seems more likely based off the situation as they move around while you drive and unloading the engine after shifting they might be shorting on something for a short period hence the dead cylinder, i would check the condition and see if you can find any signs of arcing of the plug wires, also make sure they are properly seperated.